From a worthwhile thread on Quora. “Below are two shapes. One of them is called Kiki and the other is called Bouba. This is a useful little nugget for MSR. 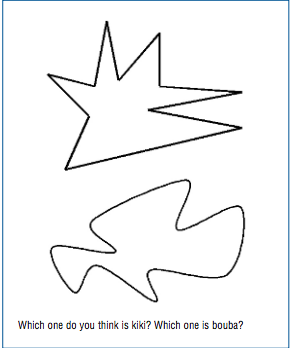 A computer would have to be programmed specifically to correlate the names with the shapes, and such a correlation would be arbitrary from a programmatic perspective. By contrast, our cross-modal, cross-cultural preferences cohere intrinsically, by feel. Feeling is not a collision of objects, it is an aesthetic presence – it is our own participation in a discernment of subjects. The anthropological universality of certain linguistic-phonetic qualities and their association with other kinds of qualities (hard sounds, hard angles, sharp edges, etc) are rooted in deeper universals of sense – deeper than evolution, deeper than matter even. If it didn’t run that deep, (to the absolute bottom/top), then there would be no sense in sense at all. We would be like a computer, linking syntactic fragments together arbitrarily by statistical relevance rather than experiential content.